On the other hand, homeowners with on-grid solar systems often wonder why their systems are unable to generate power during a power outage when the sun is shining and they need the power the most. The reason is simply because grid-interactive or on-grid solar inverters in the system are required to shutdown immediately when the grid is down. In fact, it is a key testing item in the UL1741 certification process. When the grid is down and if an inverter is still sending power to the grid, it can cause fire and even fatal accidents to repair workers. So, the dilemma is that on-grid inverters are designed to deliver power to the grid and cannot run as off-grid inverters to power AC loads, and therefore cannot be used for solar power backup systems. Off-grid inverters cannot send power to the grid so the solar energy is wasted when grid is on. Can we combine both on-grid and off-grid functions in one inverter? Figure 1 shows a 4-channel on/off-grid power inverter that inverts the DC power from four DC sources, such as photovoltaic solar panels or batteries, to AC power and supplies the AC power either through its on-grid AC output port, or off-grid AC output port. Each inverter has four input channels that can connect directly to four 250W-320W solar panels and produce 1150W AC peak power. Each input channel has its own control and MPPT to eliminate partial shading problems and maximize power production. In North America and some other parts of the world, split-phase AC standard is used. In the U.S., the line-to-line (L1 to L2) output voltage is 240V, and the Line-to-Neutral (L1 to N, or L2 to N) is 120V. Thus, the on/off-grid power inverter for the U.S. market must supply 240V AC to the grid from its on-grid AC output port, or 120V AC to the AC loads from its off-grid AC output port. As shown in Figure 1, the on/off-grid power inverter has two AC output ports and wires on the top, where the left is the on-grid AC output and the right is the off-grid AC output. During normal operating conditions when the grid is on, the inverter works like a regular on-grid power inverter that meets all UL1741 and IEEE1547 standards including: over or under voltage shutdown, over or under frequency shutdown, and anti-islanding. When the grid is down, the inverter will shutdown within a fraction of a second. 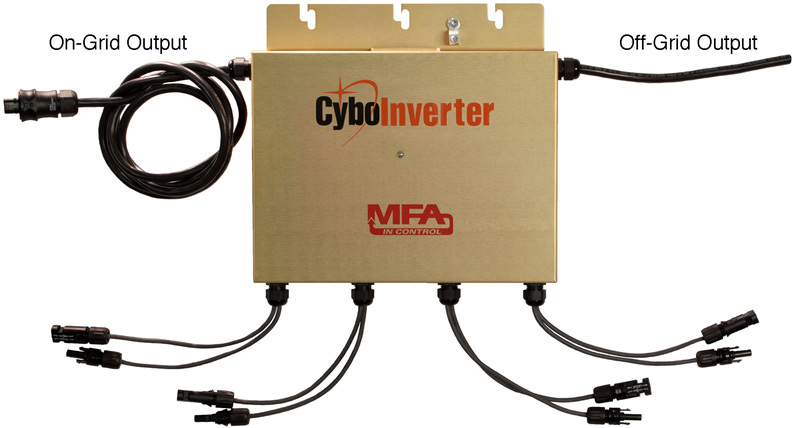 After waiting for a few seconds, the inverter sends a test signal to the connected off-grid AC circuit to check: (1) if there is AC present in the off-grid circuit; and (2) if there is an AC load in the off-grid circuit. If there is no AC present and an AC load is detected, it will start generating AC to power the load. Now, the inverter works in its off-grid mode. During the off-grid mode, the inverter is constantly detecting if the grid is back on. After grid power is detected, the inverter will wait for a few minutes to assure the grid is stable. It will then stop generating power to the off-grid circuit. After a 5-minute mandatory wait based on UL1741 standard, the inverter starts generating AC power to be sent to the grid. Now, the inverter works in its on-grid mode. For ease of installation, multiple on-grid and on/off-grid power inverters of the same family can daisy-chain using the attached AC wires and connectors. The inverters can be mounted on solar racks on the roof where each solar panel connects to an input channel of the inverter with MC-4 connectors. Since there is no high-voltage DC, the system is safe and easy to install. 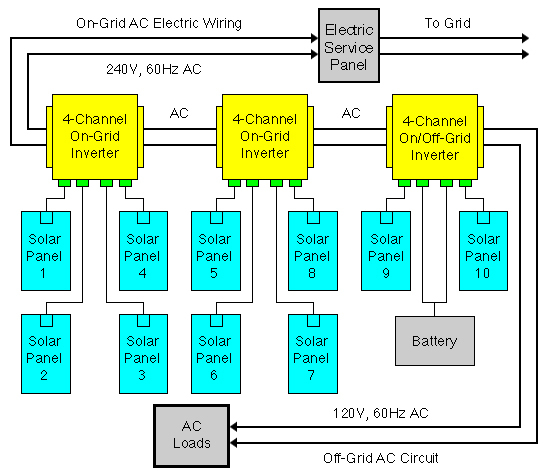 Figure 2 illustrates a 3.6KW grid-flexible solar power system that includes two 4-channel on-grid solar inverters and one 4-channel on/off-grid solar inverter. All three inverters can be installed on the roof daisy-chained. Notice that the on-grid AC output wire of the on/off-grid inverter is daisy-chained with an on-grid inverter. This way, only one on-grid AC wire is needed to run from the roof down and connect to L1 and L2 of a 20A branch circuit of the electric service panel. The off-grid AC output wire from the on/off-grid inverter can go through a junction box and run inside the house to support a 1.2KW off-grid AC circuit to power AC loads such as lights, fans, TV, computers, phone-chargers, and a small refrigerator when the grid is down. For areas where power outages are frequent, the on/off-grid inverter can be installed inside the garage. Two input channels of the inverter can connect to two solar panels on the roof using a 4-conductor DC wire. The other 2 input channels can connect to a 36V battery set. This way, the system can produce 600W AC power in the evening when the grid is down. 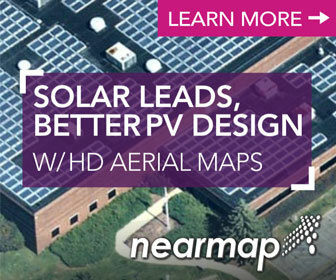 This is a scalable design so a bigger system can be easily installed with more solar panels, inverters, and batteries. The on/off-grid solar power Mini-Inverter can work in either the on-grid or off-grid mode, and switch back and forth between the two modes automatically depending on the grid condition. This means that the same solar power system can generate power to the grid and can also be a power backup system when the grid is down. 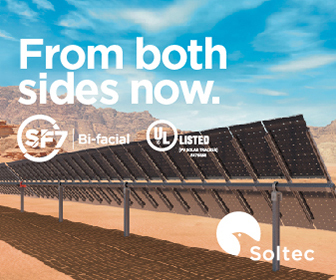 The on/off-grid solar power inverter can significantly improve the usefulness of solar power systems and make them more competitive compared with fossil fuel and other types of renewable energy, resulting in better return-on-investment (ROI) and faster adoption of solar energy in the global market. Dr. George S. Cheng is the chief technical officer of CyboEnergy, Inc.